What’s in a Fairy Tale? Science fiction encourages us to explore… all the futures, good and bad, that the human mind can envision. 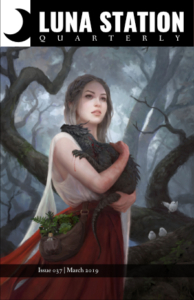 It’s by the amazing Leesha Hannigan. You can learn more about all of our cover artists on our gallery page! What the F*ck is a Mary Sue? The on-going mission of Luna Station Quarterly is to display the vast and varied talents of female-identified speculative fiction writers. We believe that women have a unique and universal voice in fiction and we aim to get it heard. We hope you enjoy the stories within. Please be sure to check out our author’s profiles to learn where you can read more of their work. If you have any thoughts you’d like to share about the site, please feel free to use the contact form and let us know what you think! LSQ is volunteer-run and we depend on your purchases and donations to pay our authors and keep the site running. Help support women writers and consider pitching in. From ongoing patronage and subscriptions to one time donations and other support options, there are many ways to help LSQ keep running for years to come.